Why have Plasma Rich Platelet Therapy at Therapy House? Platelet rich plasma (PRP) therapy – sometimes referred to as ‘The Vampire Facial’ – is an exciting and effective treatment that uses the cells from your own blood to help your skin tissue to heal and grow new cells. When plasma rich platelets are injected into specific areas of your skin, it can stimulate collagen production, regenerate tissue, and naturally smooth and tighten your skin. 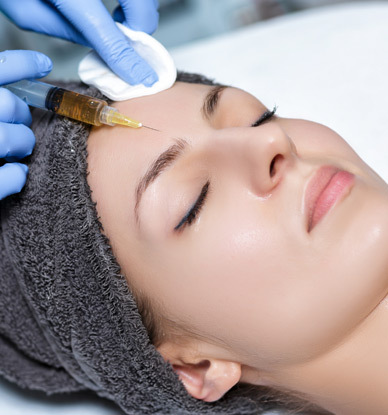 Platelet Rich Plasma (PRP) Therapy, also known as ‘The Vampire Facial’, works on the basis that the body’s own natural healing powers may slow and even ‘reverse’ the ageing process. PRP Therapy is a revolutionary repair system that places growth factors in the exact location where we want the skin to repair and rejuvenate itself. PRP Therapy is ideal if your face is beginning to look drawn or if you would like to see more definition in your cheeks, or soften the hollows under your eyes. It can also improve your skin tone, tightness and texture. Where PRP differs from other filler treatments is that we are harnessing the proteins from your own body. What is Plasma Rich Platelet Therapy? Plasma Rich Platelet Therapy – sometimes referred to as the ‘Vampire Facial’ – involves harvesting plasma rich platelets from your own blood in order to inject them into problem skin areas. Platelets contain a high content of ‘Growth Factors’, which are proteins that help to heal injured tissue or damaged skin. Upon reinjection, the platelets release these special proteins, triggering the surrounding cells to rapidly reproduce and stimulate repair. This increases the volume of your skin and rejuvenates its appearance. By the end of your treatment, your skin tone and texture should look and feel healthier, smoother and clearer. What areas of the face or body can Plasma Rich Platelet Therapy be used to treat? At the beginning of your treatment, we extract a minimal amount of your blood (10-20 ml) – this is done in exactly the same way as a doctor or nurse would take blood for a blood test. This blood is then placed in a centrifuge, which separates the red blood cells from the platelet rich plasma. While the PRP is being extracted from your blood, we will cleanse your skin. Once we have your PRP, we will inject it back into targeted areas of your skin using fine needles, which should only feel mildly uncomfortable. The procedure will take approximately 15 minutes. How soon should I be able to see the results of my PRP treatment? You should begin to see an improvement to your skin tone and texture three to four weeks after your treatment. Your skin should feel softer, and lines and large pores should be visibly smaller and softened. The results of your treatment should continue to improve over time. You may need two to three treatment sessions, spaced one to two months apart, to achieve the best outcomes, and many people choose to have a top-up treatment every six to 12 months. PRP treatments are associated with mild side effects, mainly swelling, redness or bruising that fades without intervention within one to three days. Because PRP comes from your own cells, it virtually eliminates more serious side effects, especially those associated with allergic reactions. That being said, you will be given a telephone number to call if you have any questions or concerns. Most people feel comfortable returning to their normal activities straight away or within a few hours. You may want to take some downtime if you experience any swelling, bruising or redness at the injection sites. With PRP therapy, we will recommend that you avoid the sun for 48 hours post-treatment and use a good sunscreen with a minimum SPF 30 for two weeks. You should wash your face with bottled water for at least 24 hours, and do not take any inflammatory medicines for at least two weeks after your treatment. If you do experience any tenderness or swelling, you may want to take paracetamol and apply a cold compress. Want to know more about Plasma Rich Platelet Therapy?